I couldn't go to the store to have a look at these lippies. So, a special someone (Muah!) managed to get these swatches for me. But two colors are missing. Either they were not available at the time or the SA just couldn't be bothered. I kinda like 128 and 421 and had planned to get them but after reading this blog post by Tanveer of 'Addicted to Blush', I'm a bit apprehensive. Anyways, I just thought these swatches would come in handy for some of you. Disappointed with them. Not going to buy these lippies. Have gone to shopper's stop atleast 4 times to buy them but they had no testers. Now I really have no enthu to waste my money on such a in-competitive brand. Wow!! 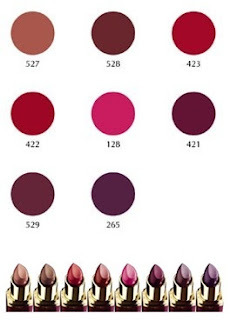 lovely shades.. wanna try 422 & 528.
ooh I like 422 and 128, they all look so pretty and pigmented! I like the colors but now i just feel very scared to get Lakme. As it is I feel guilty about spending so much, and then Lakme hands me crap, making me feel so stupid. Oh dear! I really wanted 128 and 422, but I guess reading that post totally turned me off! Still, they have lovely colours though - I keep hearing nice things about Lakme, but I can't get anywhere near here.